As I said in the first post in this series, I don’t consider my work in this area to be my own or original. I am just reviewing widely accepted scholarship on these issues. In that first post, I reviewed those New Testament passages that straight-forwardly feature prominent women leaders. In the final post in the series, I explain that Paul’s apparent prohibition of women’s leadership in 1 Timothy is actually a misreading. In this post, I will walk through the relevant passages in 1 Corinthians and show the ways that they proclaim the leadership authority of women. The passage that I have highlighted should be considered one of the most revolutionary in Paul’s writing’s on gender and marriage. Wives did not have any legal authority over a husband’s body, though a husband did have legal authority over the wife’s body. This did not explicitly extend to sexual permissions for the husband, but did pertain to her having sexual relations with others. In this context, Paul speaks a radically egalitarian word over the relationships between wives and husbands. Verse 4 speaks directly to “authority” over the body, but the entire chapter has remarkably symmetrical instructions for both genders. Those that presume that the wife is to have no form of spiritual leadership of her husband will be particularly perplexed by Paul’s instructions to wives: “For the unbelieving husband has been sanctified through his wife, and the unbelieving wife has been sanctified through her believing husband” (v. 14) and then later, “How do you know, wife, whether you will save your husband” (v. 16)? Later in the same chapter, Paul also directs widows and virgins to remain single. “An unmarried woman or virgin is concerned about the Lord’s affairs: Her aim is to be devoted to the Lord in both body and spirit.” Paul gives these instructions about singleness because he expects that the Lord will return quickly and it is therefore necessary to be about the proclamation of the Gospel. What might it mean that these widows and virgins would be devoted to the Lord’s affairs if he does not expect them to be proclaiming the Gospel in ministry? Surely this full-time devotion to the Lord’s affairs would require these women to “lead.” What else might they be doing full-time? By far the most significant passage for our discussion is that of 1 Corinthians 11. Here too we see a vision of Paul’s egalitarian notion of gender roles. This is a passage that is covered in contextual issues that makes it difficult to interpret, but a thorough understanding of the Corinthian context clears up most of these matters. Verses 14 and 15 help us to understand that when Paul is speaking of covering or uncovering the head, he isn’t talking about wearing (or not wearing) a veil or a hat. Roman and Greek women did not do so. Jewish customs on this varied from place to place. Paul is talking about the length of hair displayed by both men and women, as a footnote to the NIV at this point indicates with an alternative translation (4 Every man who prays or prophesies with long hair dishonors his head. 5 But every woman who prays or prophesies with no covering of hair dishonors her head—she is just like one of the “shorn women.” 6 If a woman has no covering, let her be for now with short hair; but since it is a disgrace for a woman to have her hair shorn or shaved, she should grow it again. 7 A man ought not to have long hair…). Men were expected to have short hair and women were expected to have long hair. Art from the period shows that respectable women of the period wore their long hair styled up on their head as a natural “veil” that showed their commitment to their husband. It was her covering. For a woman to wear her hair down was to show her promiscuity and to have her head shaved was a penalty to her for adultery, as the shame from Verse 6 indicates. The Dionysiac cult had a prominent temple in Corinth and the women of this cult were known to let their hair down to “prophesy” and also engage in sexual debauchery. It appears from the passage that some women in Corinth had taken the freedom to let their hair down in worship, even when they were praying and prophesying. He considered this to be a break from cultural mores and improper. This would be equivalent to modern American women wearing a short, low-cut dress or men wearing a Speedo…to do so is simply immodest. To do so in church is unthinkable. And Paul is directing the women not to do this. His argument for why they should not is bound up with the reasons that persons wear hair up or down. The woman wore hair up as a sign of commitment to her husband. I think Philip Payne‘s explanation of why men having long hair is convincing. He explains that for men to wear long hair was to make them like a woman, so it was to their shame. Paul does not want them to blur cultural gender distinctions. Men should look like respectable men and women should look like respectable women. Men must look respectable because they are the “image of God” (v. 7) and to look disrespectful would bring shame to God. Women looking disrespectful (hair down) would bring shame to her husband. Both are to be avoided. This discussion of cultural expectations and worship practices would be irrelevant to understandings of modern gender roles, except that Paul introduces the language of the “head of the woman is man” in this passage. Most Bible scholars agree: “head” is not a way of speaking of an authority figure in the Greek language as it is in English and Hebrew. We normally speak of the “head” of an organization and so on. NO GREEK SPEAKER DID SO. Metaphor’s are always culturally bound and often limited to particular regions or dialects. In Greek, “head” was rather a metaphor for the “source” of something. When Paul uses the language of “head” here he is speaking of Genesis 2 when the woman comes from the rib that is extracted from man’s side. He is the physical source from which she came. As Paul often does in 1 Corinthians, he counters this argument by arguing that man is born from woman so the two cannot be “independent” from one another. Woman comes from man, but man is born of woman. Let’s be very careful here. Paul is not talking about husbands and wives (as he does in Ephesians 5, the topic of my next post). Though the Greek words for man and woman are the same as husband and wife, the context is not marriage but gender generally. Clearly not all women are supposed to submit to all men, so Paul cannot be arguing for this. “Submission,” as some have understood this text, cannot be all women submitting to all men. Further, and this is very important, in the same context he claims that “the head of Christ is God.” If “head” is a role of authority over, then there is a subordination within the Trinity, which the Church has declared as heresy. Rather, Christ comes from God (the Father) as his source when he is begotten. Head cannot possibly mean authority over because the persons of the Trinity have no authority over one another, they are equal in power and majesty. The most important aspect of this passage for understanding women’s role in ministry is that these are all directions for women’s participation in prayer and prophesy. Women had taken these roles and now were needing direction for how to properly use them. Specifically, Paul is prohibiting them from taking up the impropriety that other Corinthian women religious leaders (Dionysian cult) had done and leading with their hair let down. Again we see that Paul is not critiquing their role in worship leadership. He affirms these women as leaders of the congregation, but gives further direction as to how to exercise this new authority appropriately. This passage is notoriously difficult, primarily because these verses do not flow well with those just before or after them (passages that pertain to ordering worship, but not women’s participation in it). But it is made even more difficult because 1 Corinthians 11, as we just read, gives explicit direction for how women should pray and prophesy. He cannot possible be saying that women cannot speak at all. Several interpretations have been given of this passage. Some imagine that Paul is quoting a popular phrase and then refuting it in verse 36. Paul often does this in 1 Corinthians (“Everything is permissible for me…but not everything is beneficial…”), so this is a possible interpretation. Craig Keener, N.T. Wright, and Ken Bailey are among those scholars that suggest that this passage pertains to the disruptive ways in which people would often ask questions of one another or even of the speaker himself/herself as the teaching would go on. These scholars suggest a couple ways that this might pertain to women in unique ways. Bailey and Wright think it has to do with women being basically uneducated and therefore asking lots of questions of the men (and especially their husbands) during the teaching. Keener thinks that the women were asking men that were not their husbands. Given that these churches largely met in houses, it would not be surprising to confuse whether this is public space (where women did not speak casually with men that were not their husbands) and private space (where women could speak casually with men). So Keener thinks Paul is giving instructions, to avoid impropriety, for the women to not ask questions of the other men that are gathered. In all of these arguments, the assumption is that women were being disruptive in the conversation about the meaning of what was being said due to the lack of biblical education that most women had been permitted before they became Christians. I used to argued just as these men do. I am generally very conservative on textual criticism (Textual criticism is the process of discerning from manuscript evidence what parts of the texts are most original. Many Christians are unaware that the various Hebrew and Greek manuscripts of the Bible are not all identical and scholars spend a good deal of effort to determine which is the most original version). So I was very hesitant to suggest, as many scholars do, that these two verses were not original to Paul’s letter. The interpretations offered above make sense of the letter and the other evidence around it. But I have been convinced by the work of Philip Payne, who’s work on gender in 1 Corinthians is really excellent, that these two verses were not original to Paul’s letter. Gordon Fee and many other conservative scholars agree with this conclusion. As I have already stated, the text does not flow well with the rest of the chapter. This alone should never be considered sufficient however. It is only a clue that is reinforced by 2 and 3. The early Western manuscripts have these two verses below verse 40 in the text. Other early manuscripts have these verses below verse 33 in the text. This is typical of an “interpolation” whereby a note made by scribes in the margin gets inserted into the text by later scribes. One of the scribes that did so inserted it at the “top” of the marginal note and the other did so at the “bottom” of the marginal note. Payne has shown that an early 4th Century manuscript, the Codex Vaticanus (one of the two best manuscripts that we have of the New Testament) has a little mark in the margin of the manuscript (known as distigmai) in all of the places that the original scribe knew that there were variations of the manuscript. The scribe marked well known later additions such as the longer ending of Mark, John 7:53-8:11, and 1 John 5:7 as well as 1 Corinthians 14:34-35. Even this scholar in approximately 325-350 A.D. knew that these verses were of questionable authenticity. A very early (540’s A.D.) manuscript of the Vulgate, commissioned by Bishop Victor of Capua, did not include these two verses at all. Payne thinks there is good evidence in the manuscript that the bishop required that they be removed because he knew them to not be original. If these verses are original to Paul’s manuscript then there are several scholarly explanations of how a text that is otherwise so out of line with what Paul has said can make sense in the context. I have reviewed these arguments above. But I have become convinced that Payne is right that they are later additions. First Corinthians has often been misinterpreted by those that read the text as if they are the primary audience. Paul wrote the letter for a specific audience in the church at Corinth. If read as a text for that audience, then we see that Paul is arguing for radically egalitarian relationships and giving guidelines for the leadership of women within the assembly, not restricting them from it. I think some good work could be done in suggesting how the 21st Century church needs to use these texts in guiding ministry today. Paul is giving guidelines about how cultural norms should or should not determine was is improper or immoral, and he is generally quite conservative about not breaking with these improprieties, even while resisting the cultural norms regarding gendered subordination. I think it is a great mistake to suggest that the 21st Century application of these texts includes restricting women from leadership positions. Fee, Gordon. “Praying And Prophesying In The Assemblies” in Discovering Biblical Equality. Intervarsity Press, 2005. Fee, Gordon. The First Epistle to the Corinthians. Eerdmans, 1987. Keener, Craig. Paul, Women, and Wives. Baker, 1992. Thank you for posting these. I’m writing a little on this in my blog in the next few weeks. May I refer to your blog in my posts? Please do. You should leave some links here too. Dr. Payne’s original research on this issue is amazing, and a bit hard to understand if you aren’t a scholar. It seems to require some specialty knowledge on ancient manuscripts and such. I read his book, but didn’t totally get it until a friend more intelligent than me gave me the “dummy” version. haha! But you summarized well also. I too have come to the conclusion that interpolation is the best solution. Dr. Payne should get more credit for his research than he seems to get. Thanks Laura. I could imagine that without some background there would be a lot of foreign words in Payne’s book. I think this is true of a great deal of scholarship, this is why I believe that I have a calling to help “interpret” some of that important work. I am egal and respect Payne a lot, but I think he is wrong in parts of his analysis of 1 Cor 11 and 1 Cor 14. One thing to see is that Paul was a practicing Jew all of his life, see Acts 21, Paul repudiates the idea that he does not follow Moses, that is, the Pentateuch, and repudiates the idea that he teaches other Jews to do not follow Moses. Another thing to see is that Moses/Pentateuch has a Nazirite vow in it, for Israelite/Jewish men or women. The length of the vow is set at the time it starts, but can be for any length of time. For purposes of understanding 1 Cor 11, the important part is that a Nazirite does not cut their hair during the time of the vow, so depending on how long the vow is for, one’s hair could get very long. On the natural argument, hair naturally falls out at some point, but it can be quite long when it does. There is nothing natural about cutting one’s hair. Think hairy barbarian versus civilized city folk. So both Jews and Greeks had people of both genders with long hair and no shame at all involved in it, so Paul simply cannot be complaining about long hair or thinking there is somehow shame involved in all cases. In other words, the translators think they understand Paul’s argument when they translate it to imply this, but really do not; so a different translation is indicated. It is a puzzle what exactly Paul is referring to, it is a veil or a hair covering or a hair cut or a hair do and it even might be different things for different groups, we are just not sure. But even being unsure about this aspect does not mean one cannot learn from the passage. On 1 Cor 14, I see Paul using eta, the expletive of repudiating twice in 1 Cor 14:36 to repudiate 1 Cor 14:34-35, which I see as a quote from Corinth. Don, you are right that a Nazarite vow would mean that men had very long hair, but this vow is actually the exception that proves the point. Very few persons would take such a vow and long hair would mark them from others around them. In that case, it would also be an exception to the normal perception that long hair is “unnatural”. Take it like this. Normal society does not think very highly of beards on men and certainly not long beards…its not considered professional. However, if someone is an orthodox Jew, no one would consider a long beard to be unprofessional, but instead religiously faithful. The Nazarite vow would be considered similarly. When Paul is talking about what is “natural” he does not mean what would happen if we did not intervene. Clearly he would know that men’s hair does not grow differently than women’s. Rather he is using natural as a stand in for something like “the laws of nature.” It just isn’t “right.” Living in a pluralistic world it is difficult for us to see how Paul might consider such a clearly cultural tradition “natural,” but that is his primary category for naming how things SHOULD be. The phrase “an exception proves the rule” means “an exception TESTS the rule” that is, it sees if the rule is valid or not. So the popular meaning of the phrase is entirely wrong, as it makes no sense. The Nazirite vow was not that rare, Paul was going to pay for 4 of them in Acts 21. It was seen as a way for a non-Levitical Jew to become more holy for a period of time, and the hair was a measuring device for the time, as one cut it off at the start (or if the vow needed to be restarted because of defilement) and then cut off at the end and offered to God. Also, Greek philosophers had long hair as an indicator of what they did. The point is that neither Jews nor Greeks had any shame involved with long hair on a man or woman, so any translation that implies this is basing it on more modern ideas and not 1st century ones and such translations should be rejected. We see an example of contrary to nature/phusis with the Olive Tree metaphor, a wild branch being grafted to a cultivated tree is “contrary to nature” for Paul. The grafting is what is contrary, the tree is in a natural state without any grafting. What is natural is what happens when no one intervenes, which in the case of hair is when it is cut; when not cut it grows as long as it can until it falls out. So again, any translation that implies otherwise is basing such on more modern ideas than 1st century ones. The basic problem is reading the text using a 1st century mindset, not a 19th or 20th or 21st century one. The modern idea of short hair on a man came about because soldiers in siege lines could be treated more easily for lice when they had short hair. I think it is true that the temple prostitutes at Aphrodite’s temple in Corinth shaved their heads, as a marker; that is it had a cultural meaning in that 1st century context that a believer would not want to be conveying. women are leaders. Jesus granted me a career that has turned into a thirty+ year opportunity to teach, lead, organize, develop, travel, speak, research, write, publish, raise two children, incorporate both an LLC and 501c3, et.al. and none of this in the walls of organized religion. Two months ago I joined CBE and started studying the depths of the limitations on women who could do what I do in the realm of churches/ministries yet are limited by what? Whoever wrote the book Half the Church chose a very appropriate title. If women were given the freedom to do what they are gifted to do in the name of Jesus Christ, well, ….. Thank you Jeremiah Gibbs for being a vocal proponent. I am praying for my sisters who have a more difficult task ahead of them every day than I. every day I have the freedom to be Jesus to everyone I come in contact with outside of the walls of organized religion. For my sisters within, I pray for them. We have lived in this one Ohio community for 26 years. I have done some minor things as Christian school soccer coach, Christian school gym teacher ( both volunteer roles ), taught one or two summer Bible school weeks, but never ever anything really ‘significant’ within the church. I suppose I thank my Lord that He planned for me a career in health care to live and move and have my being in Him outside of religious circles because outside is where I have freedom to do what I do every day every week every year for Him as He directs my steps. Just think of what church bodys or congregations could be if they would let women do what they are gifted to do ! Renee, I know that it may seem as if not many churches are supportive. But MANY Protestant churches are supportive of women in leadership of all kinds. In fact, I am writing the posts about this subject in part to spread awareness (that’s why they all have lots of links) of how widespread the commitment to women leaders is. Thank God that you have been given lots of opportunities and I hope and pray that the doors will be open to you to do the same within the church very soon. Excellent post Jeremiah. Personally I have been torn on this issue for years. 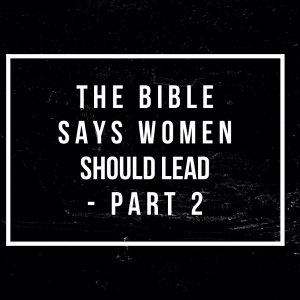 Having grown up in a very conservative church it was hard for me to acknowledge that there could be good Biblical evidence of female leadership in the scriptures. However it’s hard to deny the role of Deborah, or the women whom Joel referred to as being prophets after the Pentecost would come. I’ve taken a middle road by choosing to extend a great deal of grace to Christian brothers and sisters who fall on both sides of this issue. Both are trying to be faithful to the scriptures so I try to honor their perspectives. You did an excellent job of handling the difficult passages in this post. Thanks Ryan. In my post “4 Reasons…” I admit that I have begun to extend less grace to those that cannot affirm women’s leadership. Frankly, the main reason for this is not only the plethora of scholarship supporting the position but my experience with working with such wonderfully gifted, intelligent, and faithful college women that do not consider that God might be calling them to pastoral ministry because they have never heard it/seen it. I know that not all of these gifted women are called to pastor, but some of them are and we may not ever know (or at least not for a long time) which of them are. Thank you for giving Biblical “proof” of what I have always known in my heart. As a woman, I am not inferior in God’s eyes & I should not be viewed as such in the church. I agree with what you are saying and appreciate your insight so much. I’m trying to learn more about women in leadership within the church and God’s heart about it. Could you put 1 Timothy 2:11-15 into cultural and Biblical context? Hey Emily, I have finally posted the final post in this series which is on 1 Timothy. Do we know how recent the reading of the NIV in concern to men’s long hair was? I know that for the Eastern and Oriental Orthodox it is a requirement sometimes for men to look rather unattractive (long hair and beards covering their face) reflecting the practice of Nazarenes. Dishonour would not necessarily relate to sin. I have come across one source that has argued that “long hair” is a mistranslation. I haven’t done much investigation on this particular set of verses. So much to digest and experts make much of it rather confusing after a while though I am largely sympathetic to the Traditionalist Catholic interpretation of this and I think this set of verses does establish a divine hierarchy to which women should wear head coverings in church. Difficult text to swallow. Maybe some day, I’ll read more on this topic and have a more knowledgeable statement to make. Great post. I learnt quite a few things from it. Keep up the good work on women and ministry.